I’ve been explaining the infrequency of my postings here as due to the time I’ve spent working on an iPhone “app.” Now that it’s about to be submitted to the iTunes App Store for inclusion on that exclusive online site for selling (or even giving away) iPhone apps, it seems I should give my devoted readers a preview of the app: OnScreen Pitch Count, the first iPhone app from OnScreen Science, Inc. Pitch Count? “How could you take that long to make a pitch counter?” you may be thinking (and perhaps “How is it better than the mechanical clicker kind you can buy at the hardware store?”). Hopefully a description of what the app can do will answer both those questions. The screenshot below shows the main display and the buttons one taps to record pitch results. Incidentally, I considered naming the app OnScreen Pitch Results since it more accurately describes what the app keeps track of, but that name is two characters longer than allowed before being truncated in the App Store listings, so I’m going with Pitch Count, which may be better anyway. 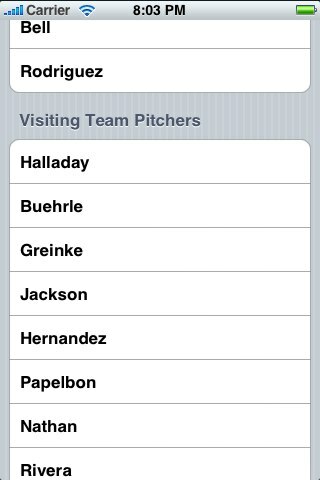 The name of the current pitcher is displayed at the top. This example is from a moment in this year’s MLB All Star game. The buttons in the lower green area are the ones that record each pitch result. One of my first tasks was to determine just what I wanted to keep track of. I referred to my own experience as a Little League coach and also as an interested baseball fan. I rejected the level of detail that would include pitch location and pitch type (curve ball, fast ball, etc.) as being more than anyone but a pitching coach or scout would probably want or be able to handle, not even considering the difficulty in coming up with a user-friendly way of recording that much information for each pitch. Using a basic knowledge of baseball and some trial and error, I came up with the buttons that are displayed above. In keeping track of strikes thrown we need not only to record pitches that add to the strike total in a given at bat but also the pitches that result in foul balls after two strikes have already been recorded or that result in balls being put into play, leading either to an out being recorded or to the batter reaching base. A great deal of thought and experiment went into choosing the size and placement of the buttons, which I have found to be easy to use in the actual flow of a game. The bottom two rows of buttons are for recording pitches not put into play: balls and the three kinds of strikes. The Walk and Strikeout buttons are not enabled until four balls or three strikes have been registered. I found from experience that putting in the extra step of recording a walk or strikeout reduced the chance of error and made the situation that much clearer. The Undo button can be tapped to undo the results of as many as two pitches, for example for changing a ball into a called strike after a hasty tap made before the umpire had spoken. It can also, of course, be used to cancel an accidental tap of any button. When three strikes have been recorded, the Strikeout button is highlighted to indicate the next step, and all other ball and strike buttons are disabled until the strikeout is recorded or the strike call is undone. At any time, only the buttons that have meaning are enabled. For example, if there are no runners on base, the Basepath Out and Run buttons are disabled. At important steps such as recording the third out, the next button to be tapped is indicated by highlighting (as mentioned previously for recording a strikeout). 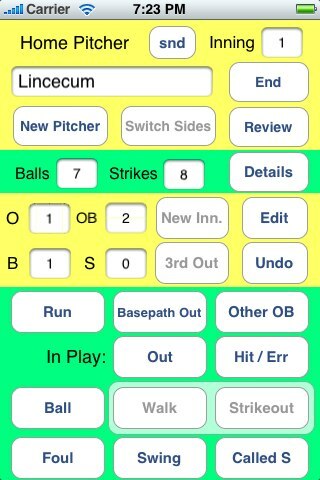 Above the two lower rows of buttons are those relevant to balls put into play and possible results with runners on base. As currently programmed, hits and errors are recorded but without the specific type of hit (single etc.). The Out button is tapped whenever a ball hit by the batter results in the batter being put out before reaching base or in a baserunner being forced out. A basepath out is recorded when a runner is put out not as the result of a hit ball, say caught stealing. In the case of a double play, both an out and a basepath out are recorded. This system of buttons keeps the hits, errors, outs, and current baserunners straight. The Other OB button is used to record batters reaching after being hit by a pitch and so on. It even has the option of the batter reaching first base after a dropped third strike, properly recording the strikeout while removing the out. The middle yellow section above shows the current situation in the inning: outs, runners on base, and the ball and strike count on the hitter. The cumulative game totals of balls and strikes (including balls put in play etc.) for the current pitcher are shown above that section. A tap of the Details button brings up the cumulative game totals for pitch results, runs allowed, baserunners, etc. for the current pitcher, as shown in the screen shot below. 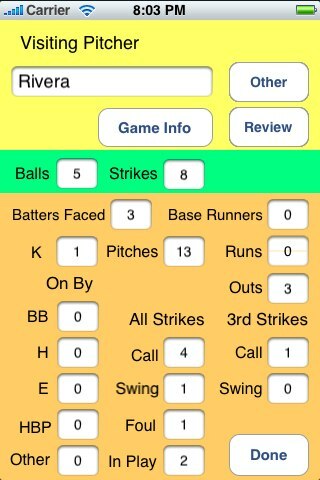 The pitcher whose results are shown above pitched only one inning as closer, but the same totals for every pitcher in the game can be brought up for inspection by a tap of the Review button followed by a scroll and a tap to select the pitcher from the list of those recorded (see below). All pitchers appearing in the game for either team can be recorded. Or, a single pitcher appearing at any point in the game can be followed alone, depending on the user’s interest. All of the data recorded in a given game is saved on the iPhone or iPod Touch and can be reviewed at any time with the OnScreen Pitch Count app. When I started to work on this project there were no competing apps that I was aware of, but since then a few have appeared. OnScreen Pitch Count lies in between some that seem to be really barebones counters of balls and strikes (with limitations on the number of pitchers) and much more detailed “pitching scout” type apps that record more data but are aimed at tracking individual pitchers over time. I think OnScreen Pitch Count should find a comfortable place in this niche of pitch recording apps. I’m pretty confident it can more than hold its own in usability and usefulness. As far as I’ve been able to tell from scanning app descriptions, OnScreen Pitch Count is the only app that properly charges runs to the pitcher that allowed the scoring runner to reach base even when the run scored after a relief pitcher had come into the game. Of course, interrupting the pitch-recording to answer the iPhone or to play a game between innings has no effect on OnScreen Pitch Count, and it will resume right where it left off whenever it’s pressed into service again. This happens automatically for pauses of up to an hour, but you can resume any unfinished game at any time, whether after a long rain delay or after you’ve paused a game tape for days. How much will it cost? I’m leaning toward $2.99. It would be worth a lot more than that to some people, but the way mass appeal apps have been forced to fight for attention on the App Store has led to popular games being sold for 99¢. OnScreen Pitch Count is not competing in the popular game market, but the depression in game prices has led to iPhone users’ expecting very low prices on anything they buy. I should mention that I found in my testing of OnScreen Pitch Count, watching both local softball games and televised major league games, that the spectator experience was enhanced by following with such close attention and having so much information literally at my fingertips. I would have loved to have had the information when I was coaching Little League. It was a lot of work to program OnScreen Pitch Count, though the development tools Apple supplies are excellent. Further improvements and my next app (I have an idea!) will be easier, assuming I get on with it before I forget what I’ve learned. In a day or two after I post this I should have more information about OnScreen Pitch Count up at this link: http://nondummies.com. I plan to have a video demonstration. UPDATE: See also “OnScreen Pitch Count Now On Sale on iTunes App Store!”, “IPhone App Updates and Experiences”, and “OnScreen Pitch Count 1.3 Is Now on the iTunes App Store”. This entry was posted on Wednesday, August 5th, 2009 at 2:35 pm	and is filed under iPhone Development. You can follow any responses to this entry through the RSS 2.0 feed. Responses are currently closed, but you can trackback from your own site.